Click on the photo to enlarge it. Simulated view from Holden Beach of wind turbines. Note: This is a low resolution screen shot, go here to see a full resolution photo. The Bureau of Ocean Energy Management (BOEM) has designated three areas for commercial wind energy leasing off the coast of NC. One area is off Kitty Hawk, the other two are off Brunswick County, roughly south of Holden Beach and off Frying Pan Shoals. BOEM did a visual assessment of what the wind farms would look like from Holden Beach. 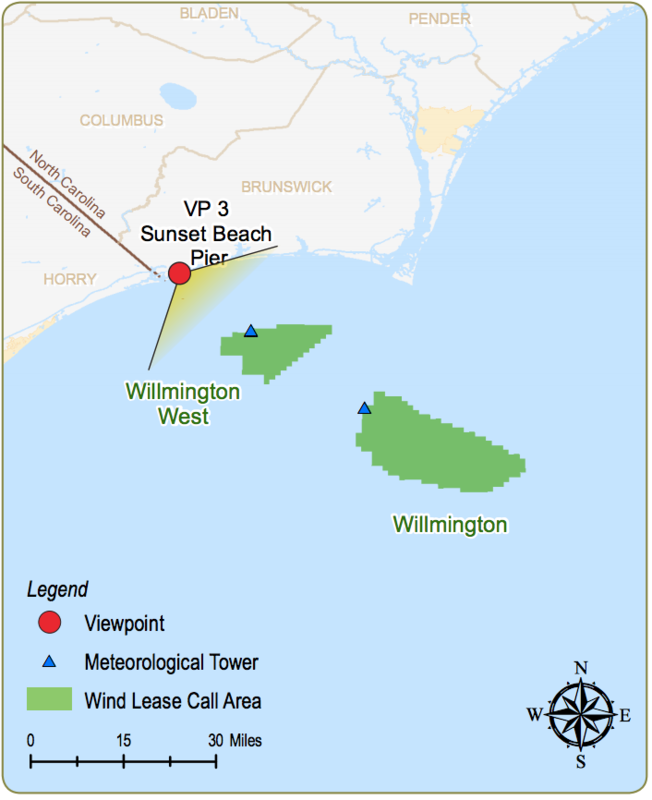 Click the photo above to see what the Wilmington West wind farm would look like using 200 656′ Vesta turbines as viewed from Holden Beach. You can see the complete visual assessment by clicking here. (It is slow to load) This would be for only the Wilmington West area, the Wilmington East area would be behind it and is not shown in the simulation, but would also be visible. In addition, each turbine, turbine blade and tower would be lit at night with red FAA warning lights, which would also be visible from shore. That is over 1000 lights with a field of 250 turbines. You can view the simulated nighttime turbine visualization from BOEM here. BOEM’s best practices call for additional lights on turbines located on the periphery and corners of the turbine field as well as any isolated structures such as a meteorological tower/buoy or electrical service platform. The Town of Kitty Hawk opposed having turbines so close and was successful in getting the nearest turbines pushed further out. The overall size of the of the project was also decreased to stay 24 miles from the Bodie Island Lighthouse. 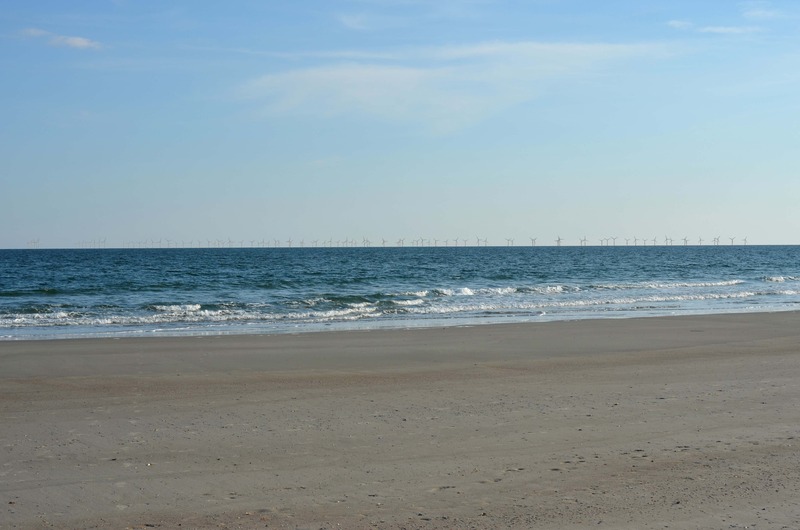 N.C. Department of Environment and Natural Resources Secretary Donald van der Vaart has urged a federal agency not to sell wind energy leases within 24 miles of the state’s coast. He asked for the same protections for the Wilmington area as the Kitty Hawk area was granted due to concerns over tourism. He said studies commissioned by New Jersey found significant declines in tourism when energy projects can be seen from shore. The Environmental Assessment (EA) for the Wind Energy projects was released for public comment January 22, 2015. Click here to view the EA. The first step in the process would be to construct 394′ meteorologic towers to assess the wind potential. 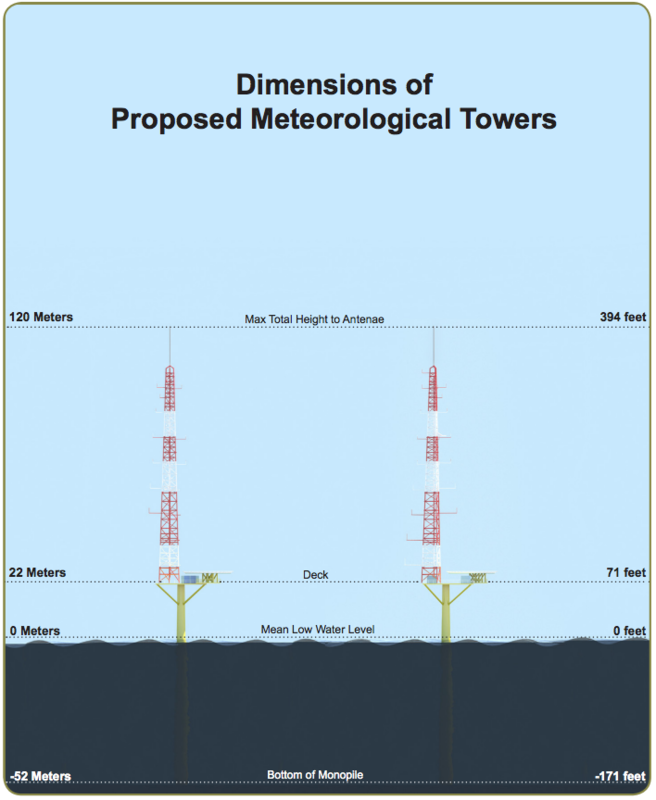 The BOEM did a Visual Assessment of what these towers (not turbines) would look like from shore which you can view here. (This file might take a while to load, visual simulations from Sunset Beach start on page 37.) It shows what the meteorologic towers (not turbines) would look like from different vantage points at different times of the day and night. These towers are shorter than actual turbines. At the Labor Day meeting HBPOA members voted to oppose a location less than 30 miles off the coast. Click here to see our resolution. To date, the Town of Holden Beach has not taken a position on Wind Farms off our beach. We hope that you will keep informed about energy development along the NC coast and its potential impact on Holden Beach. Thanks to member Phil Primm for keeping this issue in the spotlight. UPDATE 3-8-16: According to Brian Krembor of BOEM, due to the high number of concerns about the viewshed, the designation of critical habitat for the endangered Right Whale and the wind farm call information for South Carolina, development of the Wilmington East and Wilmington West Wind Energy Areas will be pushed back. These areas will be combined with the call areas for South Carolina and a new joint committee will be formed. This will require a new Environmental Assessment (EA). Brian estimated that these changes will put the Wilmington area development at least a year behind the Kitty Hawk area. Click here for a white paper on offshore wind turbine visibility. However, keep in mind that this paper and photos focus on wind farms with far less turbines. The final number of proposed turbines has not been determined yet, but estimates are around 250 turbines per call area. I would like to know who is profiting from this. Obviously someone will be making a ton of money. I am in favor of green energy and do not mind the daytime look of the wind turbines near the horizon. It would be nicer if they were not visible from shore at all and hence further off the coast. It would REALLY detract from the night view with red lights blinking. . . is there no alternative to these red lights??? This would be horrible as the nightly star show, with few cities nearby giving light pollution in Brunswick County, is spectacular against the velvet black skies.